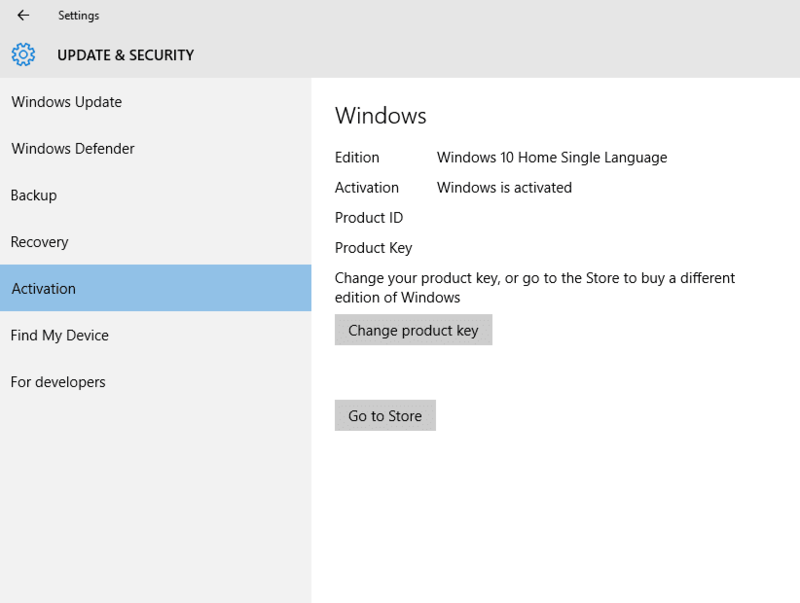 Whether you used Microsoft’s free Windows 10 upgrade offer or got a new license off retail, MSDN and the likes, you need to know how to find your Windows 10 product key and how activation works on free upgraded as opposed to new retail copies of Windows 10. Here’s everything you need to know about Windows 10 product keys and activation process. If you have used a genuine copy of either Windows 7 or Windows 8/8.1 to upgrade your PC to Windows 10, then your license will be tied to the hardware you upgrade on, and not your Microsoft account. In this case, you won’t get any new product key either. This can be verified by using any third-party product key software like ProduKey or The Ultimate PID Checker. They will show you generic product keys like TX9XD-98N7V-6WMQ6-BX7FG-H8Q99 for Windows 10 Home and VK7JG-NPHTM-C97JM-9MPGT-3V66T for Windows 10 Pro edition. I av installed windows 10 without the product key and I av notification on my screen to activate the windows. So how do you find your product key? There is nothing in this article that even somewhat represents the title. back to my Activated Home edition… How can i do that!!!! help Me….. Check my comment link. Here’s how hackers got free windows 10 upgrade? Do check it now. Hi techworm.net I saw you showed some detail about window 10, and might know a lot of things in this party. For the question I’d you find some answer if possible. I want to know System Components and Environmdnt Subsystem in window 10. Can you find the answer? Thanks. So how do I check my almost fatally-wounded laptop with third party software for my product key when it’s…. well, fatally wounded. I have a repair disk but last time I finally and miraculously experienced something other than the bsod the repair disk wouldn’t proceed without the key. I have used the BIOS to change the boot order already and am trying to find answers using my Android phone. As you know though, the phone can’t heal the ‘puter. Anyway, I do have another working laptop but it’s Vista OS and always will be as I missed the upgrade window by a month. I have a recent restore point on a USB drive for Windows 10, and a backup as well, but the computer won’t start with it. Likewise, I am a Windows insider so I also have a copy of developers Win 10 onna USB drive which h the Vista machine won’t use because it does not have the right drivers & there’s no Vista support from Microsoft. I am willing to learn and have used PC’s since they existed so I have some knowledge, but I would appreciate some advice on this one, please. Thanks!